The following is an email conversation I had with Ben Greenman, an editor at The New Yorker and the author of Superbad (McSweeney's) andSuperworse (Soft Skull Press). His new book, A Circle Is a Balloon and Compass Both: Stories About Human Love is now available from McAdam/Cage. Greenman has demonstrated an ability to write in multiple tones, genres, and settings, and the variety of his work has always been a source of both satisfaction and envy to me as a reader and a writer. Struck by a sentence in his new book, I contacted him to see if he'd be willing to discuss it. And specifically, I’m curious about the second sentence. It reminds me of the magician’s trick, misdirection. You see misdirection in stories now and then. A first-person narrator will tell you something about himself without meaning to, and that’s an example of the author using a sort of misdirection. But, here, we have misdirection at the paragraph level: a interruption of the scene. And an interruption by a fairly remarkable event, as well. Am I right in assuming you mean this to be both an event and a metaphor? If so, why insert that break right there? Well, it is both an event and a metaphor, yes. The story is broadly concerned with birds—it opens with the yearly spring returns of the swallows to San Juan Capistrano, and the swallows resurface in the monologue of the bishop who gives the story its title. The bishop employs them as a metaphor to explain his own sense of disconnection and is tragically misunderstood. The bird's expiration from exhaustion is also evidence of the length of the conversation between the narrator and the woman he loves. He is bantering with her and beginning to feel the attenuating effects of banter, beginning to feel that he would rather hold her hand, touch her hair, or look into her face than suffer the distancing effects of language. This sense of defeat on his part follows the woman's announcement that she is tired of being written into other people's stories. So the bird is made to bear a great deal of weight, and it is surrounded by a great deal of gravity (in a story about jokes). Maybe that's why it falls. In those respects, the bird is not an example of misdirection. In other respects, of course, that's exactly what it is. It pulls readers away from the story at hand, a horizontal story of a conversation, and makes them look up (at the word "bird") and then down (at the word "falls"). But its misdirection is really a redirection. In fact, the image of the falling bird appears in two other stories: it is the title of a pop song (which is itself a major plot point) in "Oh Lord Why Not" and it is a drunken insult delivered by the main female character of "Batting Cleanup." In the collections of fiction I have written, I like to have the stories talk to one another. They are like relatives at a reunion. Some are shorter, some are more successful, some have come a longer distance to get to where they are; they are grouped together not because they are so stylistically diverse but because they have some fundamental similarity. There are echoes and repetitions and resurfacings, some unconscious, some calculated. Either way, the bird has to be able to fall from one story into the next. The fact that you consciously, semi-consciously, and unconsciously threaded the same image through this collection makes me wonder about the nature of the short story collection. When Superbad was remixed to become Superworse, it went from being "Stories and Pieces" to "A Novel." 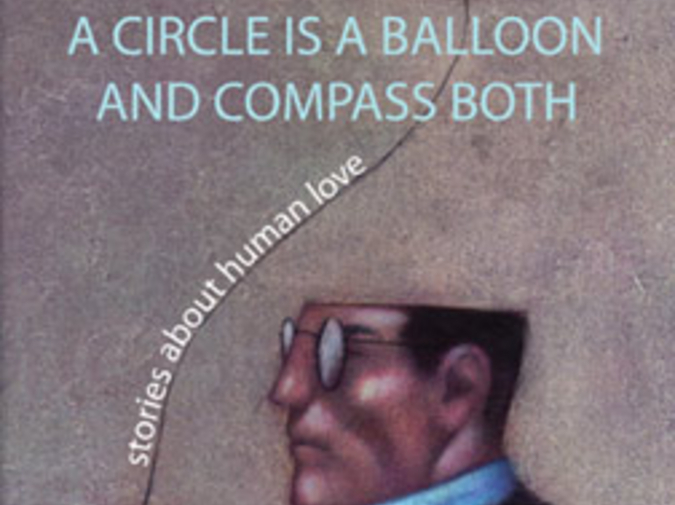 A Circle is a Balloon and Compass Both is subtitled "Stories About Human Love." Following the same theme or the repetition of images aren't the sorts of things one usually associates with a connected short story collection. Can you tell me a little (or, heck, a lot) about what attracts you to them as organizing principles? Also, themes, images, and odd sentence structures are all things that I've found can be really infectious to me as a writer, but I can, if I examine them—which I tend to do on second and third drafts—I can often find some current, real-life reason for the infection. This can make any suite of stories a sort of psychological landmark for the author. In the spectrum of the personal to the universal, do you lean one way or the other? I like any organizing principles. Fiction, like any art, is supposed to organize experience, to make the indigestible digestible and the incomprehensible comprehensible. Repetition of images is one way to do that. Another is to work with mirrors—Superworse was pretty rigidly organized so that the first story matched the last, the second the next to last, and so forth, and this collection had the same architect. These apparently rigid rules are in fact very liberating for me. They mean, for starters, that I will have to look for connections between apparently disparate experiences, and that I will have to work to make the foreign familiar and the familiar foreign, and that I will have to tamper with or drill deeper into the observational record until I find echoes or patterns or kinships. Those things are there already—life furnishes the substance—and so it is up to style and structure to bring them into relief. That's kind of abstract and universal, but it shades into the second part of the question. Of course, the recurrence of those images is psychologically revealing, both for my characters and (by extension) for me. To return to the earlier avian figures, it's clear that birds that fall from the sky are example, if not always symbols, of freedom rapidly curtailed. One minute you're as free as a bird. Then bam, thud, or some variation on that two-note song. That's also what can happen with a love affair: you have a sense of boundless freedom one second and the next thing you know you're compelled toward, as if forcibly. So, yes, the images seem universal, but they're personal. The only other thing I'll say is about the idea of a "current" real life-reason for certain fictional concerns. Timing is strange. When you read a novel, you go forward, Point A to point Z, with occasional moments of moving backward in the text to confirm a plot point or a character's name. That's the unspoken contract. When you read a collection of stories, it's a slightly different contract. You're allowed to skip a story that seems uninteresting, or too long, and to come back later, but still the movement is pretty much front to back. When I write, it's much less clear than that. The initial process of composition happens over a long period of time, so there's no period that can be easily circumscribed as "current." Sometimes the seed of a story is a year old; sometimes it's twenty years old. Then the collection starts to come together, at which point the writing goes out in all directions at once. The last story written might be placed first. Two stories might be paired in the middle of the collection and as a result require the changing of names so that they’re not too similar, or so that they are. A story might need to be moved from Minnesota to Texas so as not to seem too similar to the story that precedes it. I like to walk around in the stories, surveying the land. That's why I need a compass. The links in your collections are made all the more engaging by the fact that the stories have so many different tones. This is truer of Superbad and Superworse, but, as the Susan Minot blurb about you says, you seem to work in so many different voices. Can you say anything about the eclecticism? Do you read in widely divergent genres? And on the subject of the liberation in a rigid set of rules, do you see your work as an extension of the experiments in constraint writing by, say, the Oulipo? As for Oulipo, there are many Oulipo authors I love, and many who have been very important to me at various points: Queneau and Perec, mainly, although I read Roubaud "Some Thing Black" a few years ago and liked it very much. It's not unrelated. Borges isn't unrelated. Barthelme isn't unrelated. Barth isn't unrelated. But neither are Fitzgerald, or James, or the Bible, or Sterne, or Stein. For the record, I found the metafictional distractions in Superbad quite enjoyable because they were just so darn funny. Do you think that in some way the more playful work has improved your more “straightforward” fiction by making you more receptive to odd craft choices? Or do you think it’s a way of getting certain ideas out of your system? It's so hardwired into me that I don't know whether it's a mind-expander or an emetic or what. I do think that metafiction, when it comes, should be funny, or at the very least playful. It is inherently a form of play. But I also have some stories that are less experimental in that regard—"Snapshot," from the first collection; "In the Air Room"—from this one, and those are stories that I'm very fond of, because I like straightforward fiction, too. In those cases, the playfulness becomes part of the world of the story. They're diegetic, to borrow a film term. So in "Snapshot," there's a motif of how artistic capture balances liveliness and mortality and in "In the Air Room" there's a motif of commissioned v. expressive artwork. Both of those motifs reflect back on the work, but not in the foot-through-fourth-wall sense. You mentioned the mirror frame of the new book. I was wondering if you could comment on another frame you use in your books: the authority/mentor figures of Laurence Onge (Superbad and Superworse) and Marie Palermo, you're second-grade art teacher, who wrote the introduction for the new book. What function do they serve? And do you want people to consider the possibility that they might be real? I do want people to consider the possibility that they are real, at least in this sense—I want Laurence Onge to consider that Marie Palermo is real, and vice versa. They serve two functions, one for me and one for other readers. For me, they are figures of superego, if superego was funny. Laurence Onge, for example, is very disparaging of my work. He thinks that I am a man of many ideas, few of them interesting. It's good to have someone like that on my shoulder—although it's also possible, as some people have pointed out, that he allows me to discount any editorial pressure as equally unreal and invalid. The function for other readers is a little different. Years ago, I was in a Ph.D. program, pursuing my degree in literature. I didn't get it. I left the program. But when I taught, I was always surprised by the power of editorial supervision. If I gave students a story to read, they would come up with ideas, judge style, characters, etc. If, however, I gave them the same story and introduced it with a single line of italic type (say, something like, "In this story, written in 1951, Hachermecherblech appears to be commenting on the derailment of a Pennsylvania Railroad passenger train near Woodbridge Township, New Jersey, an accident that claimed the life of his Aunt Lucy"), they read it entirely differently. Now how can one sentence change the meaning of so many other sentences? The phenomenon was strange to me. Every author is influenced by other people, or could become clearer with the addition of an extra layer of editorial presence—clearer and at the same time more befogged. But not every text permits that presence. Why not? This has been very enlightening. Any final thoughts or comments? Just that I hope people like the book, are amused and/or disturbed and/or moved by it in some way. Matthew Simmons is the interviews editor at Hobart. He is also The Man Who Couldn't Blog. He will be participating in Seattle's Race for the Cure and would appreciate any support, either financial or moral.